After explaining numerous Atlas functionalities on this blog, I’ve decided it would be a good idea to put all these concepts into practice. So, over the period of next 10 days or so, I’ll build a small, but completely Atlas based application. Along the way, I’ll write regular blog posts about everything being done and how I did it. The “sliding task lists” application is a kind of to do list, that I practice every day for my work, but I’m using notepad for it (not so web 2.0, ehh?). Basically, I’m going to build this application for myself and show you the process. There is a possibility, the actual application will be hosted somewhere on reblogger lab, but I’m not 100% sure just yet. So, here is what I need. All my tasks are divided into three different lists. “Big tasks” – when I’m developing reblogger, adding a new feature to it represents the big task, since it can anywhere from several days to several weeks to get it done. 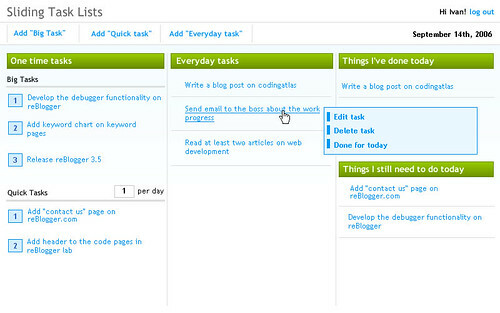 “Quick tasks” – this is for example adding a contact page on reblogger.com. Something that takes at most 1-2 hours. I decided I will do every day one item of this list, so that I don’t get buried in those little things. “Everyday tasks” – this is something that I need to do everyday, no matter what else pops out. Writing a post on this blog is one of these everyday tasks. The idea is following. I have to do ALL the tasks from my “everyday tasks” list every day. Pretty obvious. I have to do 1 (but I may change this in future) of “quick tasks” every day. The rest of the day I spend on working on big tasks. I always work on the first item in the list, so the order is important since it indicates priority. Some other requirements: I want to be able to add tasks, edit them, and delete them. I want to be able to reorder tasks when my priorities change. I want an easy way to mark task finished. And finally I want to have a way to see what I’ve done so far this day and what I still need to do. I’m going to use atlas to build this application. So obviously, you can imagine there will be no postbacks, but there will be a lot of drag-and-dropping and stuff like that. I’ll work for about 2 hours a day on this project and every day I’ll blog on this. Feel free to ask questions, give suggestions or simply criticize me when I do something that could be done much better. I hope you’ll have fun with this series and maybe even learn a thing or two. I’ve opened the flickr set with the GUI mock up, so you can go there and check it out. I have used a calendar control instead of your reorder list. Rest all is same as you have done. The only issue, is after saving a row to DB, the whole page is refreshed though I have used the update panel only enclsing the calendar control. I dont know I wrote __doPostBack(‘lnkRefreshTasks’,”); in the js just like you, but I am not getting the fast refresh effect like u. Its refreshing the whole page. Can u pls suggest anything ? Hey, I love seeing up with what people have got to think about poker and all sorts of the news.I’ll be popping by in a few days to find out what else you have to say. This is very informative story and great comments. Thanks for fod story!